Reading Desert, by J.M.G. Le Clézio is a vivid experience. 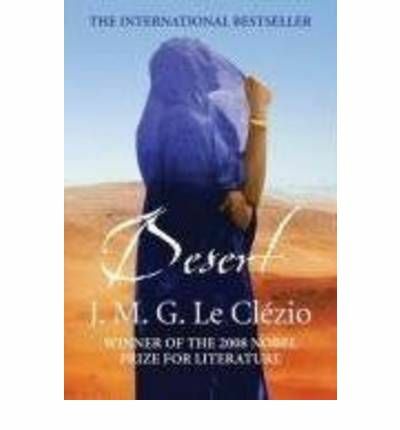 The citation for Le Clézio’s Nobel Prize reads that he is an ‘author of new departures, poetic adventure and sensual ecstasy, explorer of a humanity beyond and below the reigning civilization’, and this is certainly true of Desert. As I said when I posted a Sensational Snippet from the novel, it is a strange, hypnotic work, depicting the lives of a nomadic desert people whose way of life was disrupted by colonial invaders. It chronicles exile, new beginnings, and the fragility of a displaced nomadic tribe, the Tuaregs a.k.a. the Blue People, and it does so in language and a novel structure that mirrors the experiences of a civilisation uprooted by French colonisation in North Africa. It is incredibly sensual: Le Clézio brings the desert to life with light and colour and a sense of the sands and winds as living beings. [Note, by the way, that carefully-placed comma between ‘old man’ and ‘old woman’, forcing the reader to pause momentarily in order for the magnitude of these unmarked deaths to sink in]. Generations later, in the second narrative, Lalla’s desert is benign. An orphaned descendant of the remnants of Nour’s tribe, she is blithe despite the deprivations of her shantytown home in the Project, a refugee camp stuck out in barren coastal Morocco. Lalla is at home here: she cherishes the changing light, the shifting sands, and the scraps of wildlife that share her environment: an occasional snake, flies and wasps. Le Clézio does not romanticise the joys of her life: he is making the point that this child has never known anything else and takes pleasure in whatever comes her way. She is wild and wilful, and with her friend The Hartani, she explores places known only to him. He is a deaf-mute considered to be possessed by a djinn but the children communicate wordlessly. They have a spiritual connection nurtured by their love of the natural environment, such as it is. But for girls, even those as young as Lalla, the future means being married off and Aamma her aunt organises a potential suitor. This is intolerable to Lalla, and she runs away, eventually making her way to Marseilles. Marseilles turns out to be an emotional desert for Lalla. Le Clézio demolishes the dreams of refugees the world over: the refugee experience is bleak and harsh, embedded in poverty both real and spiritual. The train station is also one of the places where you can see without being seen, because there is too much agitation and hurriedness to pay much attention to anyone. There are all sorts of people in the station, cruel people, violent people with bright red faces, people who shout at the top of their lungs; there are very sad and very poor people too, old people who are lost, anxiously searching for the platforms their trains are leaving from, women with too many children who hobble along with their loads by the cars that are too high. There are all of the people that poverty has brought to this city, blacks who have come off boats, heading for the cold countries with their colourful short-sleeved shirts and a lone beach bag serving as luggage; dark-skinned North Africans, layered with old jackets, wearing ski caps of hats with ear flaps; the Turks, the Spaniards, the Greeks, all looking worried and weary, wandering around on the platforms in the wind, bumping into one another in the midst of the crowd of indifferent travellers and jeering soldiers. Lalla watches them, just barely hidden between the telephone booth and the information board. She’s backed into the shadows pretty well, and her copper-coloured face is shielded with the collar of her coat. But from time to time, her heart starts beating faster and a flash of light darts from her eyes, like the reflection of the sun off the stones in the desert. She watches all the people who are headed for other cities, for hunger, cold, misfortune, those who will be humiliated, who will live in solitude. They go by, stooping slightly, eyes black, clothing already worn from nights of sleeping on the ground, like so many defeated soldiers. The language swirls about, mimicking the undulations of a desert landscape. Le Clézio achieves this with paragraphs that build in intensity, repeating phrases that describe the emptiness, modifying them, blurring them and occasionally flicking into them some small discordant event like the bite of a wasp or a brief lashing of sand blown by the wind. It is mesmerizing and seductive, and the reader has to keep searching for small details that advance the plot, much like the nomad seeking almost imperceptible shifts in landscape that guide him through a desert landscape that hides its secrets. It is easy to be lured into a kind of lassitude, an endlessness of days all the same, and lives on hold. It is almost has if the reader has to fight against the hypnotic text, to remind herself that there are characters for whom time is moving on and what will become of them? Le Clézio won the Nobel Prize for Literature in 2008. When in the wake of the prize publicity I bought his Wandering Star there wasn’t much to choose from, but now there is a wealth of English translations of his books. Your comments in themselves – on ALL novels, etc that you review – are SO brilliant to read, so mesmerising, so insightful, honest, and evocatively poetic. Thank you, Lisa. I should add, Lisa, that I base my reading choices on YOUR reviews! I read this book several years ago and fell in love with it. I agree the desert scenes are remarkable, and you are easily taken there by by Clezio. A very insightful novel. I did get this and read it. It took me two weeks – for an average 3 books a fortnight, that is a huge read. I couldn’t rush it (not that I normally rush books, well… only some). Yes, you are right, it is hypnotic and engaging, but you need to give it time to seep into your skin, like the desert seeps into the characters skin. I’m glad I read it on the strength of your Sensational Snippet. Now I’ve moved onto a fast read, Darkness on the Edge of Town, which I believe I have also picked up after reading a review of yours!!! (I would feel sadly responsible if you didn’t). And now Darkness on the Edge of Town, that was such a good book, I hope you like that one too! Yep, I liked it too. Fast-paced and well drawn characters.